I'm not a big cracker eater in general, as the primary ingredient in crackers is often enriched wheat flour, which does not have much nutritional value. At the same time, I always keep my eye out for crackers to serve when friends come over, or to put into my soup, or to make low calorie hummus and fat free cheese snacks on. I also look for crackers that are low calorie for a decent sized serving. So, when I found, Aunt Gussie's Cracker Flats I was thrilled since they exceeded my standards! These crackers are made primary with organic spelt flour which has a nutty flavor that I love! The whole ingredient list (for the garlic flavor that I buy) is: organic whole grain spelt flour, fresh onions, garlic, organic milled flax seeds, egg whites, non-gmo expeller pressed canola oil, and sea salt! The cracker box also boasts that the crackers have more than 8 grams of whole grain per serving, which is a huge plus! Each serving is of one ginormous cracker (24g -- approximately 9 inches long, and 2.5 inches wide), with 60 calories, 1.5 grams of fat, and 2 grams of fiber (so 1 weight watchers point). I actually think the calories per cracker may be a bit less than what is on the box, since I weighed one of them on my scale and it was only 18 grams. But, I am still counting 60 calories just in case. The crackers come in some other yummy sounding flavors including cinnamon raisin, sesame jalapeno, everything, herbes de provence, cracked pepper, and plain onion. If you can't find them at your supermarket (I found them at a fancy food store), you can always buy Aunt Gussie's Cracker Flats from Amazon or the Yummy Diet Food Store. I love crackers.. crunchy things. 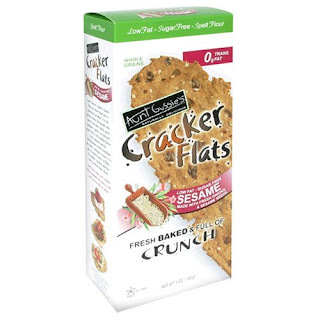 I used to inhale tons of popcorn and pretzels but found healthy crackers met my craving needs when those urges hit. They were a better options because 1. I ate WAY too much popcorn thinking it was "nothing" anyway... and 2. I am a bit more careful to portion out crackers than I am pretzels.. no grabbing a handful of crackers. This is definately a brand I'll start looking for. Like Joanne, I love anything crunchy too. Typically, I stay away from crackers for the same reasons you've mentioned, Juliet ... but these sound awesome. Thanks for the tip! Great find!! I will keep my eyes peeled. Can you post the name of the food store you found the crackers in? I live in the bay area and would like to try and look for them if I can. Thank you, Tamar at meser dot net. Ooooh, I would love these! Especially with hummus which I am completely addicted to lately! Juliet, just wondering - have you ever tried the grain, kamut? I was thinking about trying some, but wanted to get an idea of what it tastes like/similar to. Thanks! The store is called Piazza's Fine Foods! You can also get the crackers directly from the people at Aunt Gussies. They have a retail website which is www.AuntGussies.com. If you like crackers, you'll love Skinny Dippers from Pita Break. I buy their Organic Spelt Whole Grain Crackers. At 90 calories, 1.5 grams of fat, and 3 grams of fiber, you can have three generously sized crackers for just one Weight Watchers Point! They also have six other flavors, including Chipotle, Flax & Honey, Multi Grain & Honey, Organic Whole Wheat, Rye, and Apple & Honey.